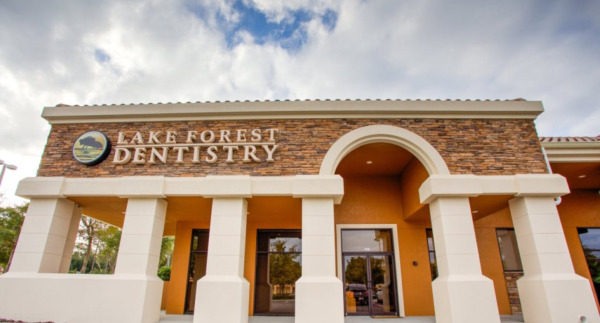 Lake Forest Family Dentistry is devoted to restoring and enhancing the natural beauty of your smile using conservative, state-of-the-art procedures that will result in beautiful, long lasting smiles! At our conveniently located dental office in Sanford, FL, we offer ALL aspects of Family and Cosmetic Dentistry. Our practice philosophy is to provide the highest quality dentistry with honesty, integrity and commitment to excellence. Our goal is to help you save all of your teeth for the rest of your life. Our enthusiastic staff will deliver the highest quality care while educating our patients. Therefore, we will take the time necessary to ask questions, listen to answers, and explain care in ways which are meaningful to each individual patient. Our new office is truly state of the art. We have some cutting edge technologies such as Cerec, which through a computer, can make a crown in about an hour. Also, we have dual Internet connected Statim sterilization. What this means is if one of our sterilizers fails to sterilize even one time the manufacturer will notify us immediately in real time. Additionally, there is more recent evidence pointing to the collection of bacteria in dental water lines being a significant concern. To address this we have installed Vistaclear dental filtration to ensure all water lines are bacteria free. In addition to being cutting edge in our practice we we are the first practice in Florida (and maybe the country) to be powered 100% by solar energy. We generate on average 150 kw of power daily using only the sun. We wanted to not only do the right thing with your teeth but also with the environment too!